There we were, me, Carrie and Evelyn*, three California girls stuck inside my Subaru in the middle of an ice and snowstorm without a scrapper. We’d decided to leave their cars on campus because the roads were a wonderland of wintery materials storm clouds had thrown at Flagstaff that day. “I think we can dig ourselves out with a credit card. Do you have one you don’t care about?” I was incredulous, but looking at Carrie’s face, I could see she was determined. “I’m a grad student. I care about all of my credit cards. And that’s a lot of snow, MacGyver,” I said to Carrie. We couldn’t see out the windshield, the passenger windows and windshield wipers were frozen in place, and I’d had to give the driver side door a mighty tug to pry it open. I looked out the windshield, trying to laser vision my way through the ice. I moved from New York because I don’t like snow. In the city it can snow a foot and a half in less than 24 hours, leaving humans stranded in their diorama-sized apartments for god knows how long. I, one of those humans for ten years, would press a hard-earned twenty-dollar bill into an equally (if not more) hard-working frozen palm of the delivery guy after he’d braved the storm to bring me my shrimp pad thai. New York winters were all about avoidance and struggle. Avoid the snow. When you’re in it, you struggle. When I moved, I told myself that my body was pre-conditioned to hate snow biologically. I don’t hear of many snowstorms in Lebanon or Mexico, where my ancestors came from. 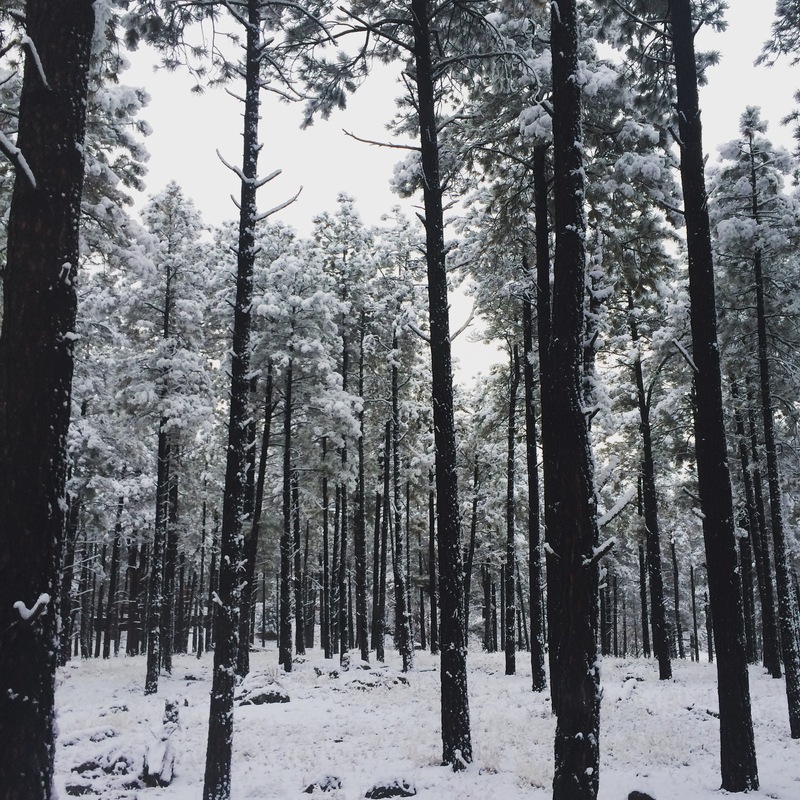 But the few times I’d seen snow since moving to Flagstaff, I’d actually found it rather beautiful, which made me more game for this experiment. We got out of my warm Subaru and dug in. First we liberated the windshield wipers, then we set in on the snow built up over the glass. There was a light snow falling as we worked, three shadows backlit by the headlights. The cards made a scraping sound as they made contact with the glass, but because they were so small compared to the size of our job, we sounded like a team of mini lumberjacks wielding pintsized handsaws. “You missed a spot,” Carrie joked, but we worked diligently, our fingers reddening in the snow. When the job was done ten minutes later, we hopped back into the car and held our hands over the heater. “Nice job, MacGyver,” I said. “Yeah, not bad for three gals from California,” Carrie said. We laughed as I put the car in drive.